Lakshmi Narasimhaswamy Temple Parikkal is the only temple where Lord and Mother are embracing each other. This temple is located in Villupuram in Tamil Nadu. In this temple, Lord Narasimha is in the sitting with a smiling form facing east , and Mother Laksmi is sitting by His side. Another speciality of this temple is that though it is a Hindu temple by religion, other religions like Muslims and Christians also worship here without any feeling of discrimination. Sri Anjaneya (as Veera Anjaneya and Bhaktha Anjaneya) is also worshipped here in the north-west corner. 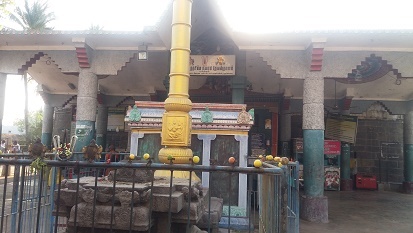 The holy spring Garuda theertha is in the north-west of the temple. This ancient temple was built by King Vasantharaja of Vriddachalam. How did the temple get the name Parikkal Lakshmi Narasimha Temple? According to legends, Lord Narasimha killed demon Parikarasura in his attempt to kill king Vasantharajan who was performing yagna for the Lord. Hence this place got the name Parikkal. Earlier this place was known as Parikarapuram, which gradually became Parikkal. The original temple was destroyed during Mughal invasion and the present temple was built by Veera Narasimha from Karnataka. 6 am to 1 pm and 4 to 8 pm on all days except in the month of Margazhi. 4.30 am to 12.30 pm and 4 to 8 pm in Margazhi month. More further details please refer the temple website. There is a strong belief that this temple is a very powerful and all miseries such as Debts, Enemies, Diseases, etc can be vanished from one's life when one offers prayers at this temple. It is a custom here that devotees after lighting lamp with gingili oil, spread Navadhanyam, write their wishes and pray. How to reach Sri Lakshmi Narasimhaswamy Temple Parikkal? By Rail - Passenger train from Villupuram and Vriddachalam stop at Parikkal railway station. By Road - This Temple is 3 km on the branch road of Villupuram - Ulundurpet road (Tiruchi - Chennai By Pass NH45). Bus facilities are available from Villupuram and Ulundurpet but not frequent. You can get down in Gadilam (Kedilam) Junction and get mini buses or Auto service to reach the temple. If one can visit all the three Lakshmi Narasimhaswamy temples - Parikkal, Poovanasankuppam and Singrikudi - in one day, it is said to be very good and auspicious for the devotee.